Is Bodyguard better than Dabangg? Will you be watching "Bodyguard" this Eid ? When it comes to being punctual and doing his duties perfectly, Lovely Singh (Salman Khan) is unmatchable. Taking great pride in what he does, he spares no effort in giving his everything to his profession. Summoned for an assignment of guarding Divya (Kareena Kapoor), the daughter of Sartaj Rana (Raj Babbar), a business tycoon, Lovely Singh accompanies her to her campus, but ends up rubbing her the wrong way with his over-protective nature and paranoia about security. She finds him to be a major obstacle in leading a regular college life. To throw him off-track and get him out of the way, she comes up with a 'master-plan'- that of trapping him in a fake love affair. 'Once he's smitten by the girl of his dreams and is reveling in his new-found romance, he will leave us alone, and we shall be free to do our own thing unhindered', says Divya to her friend Maya (Hazel). She becomes an anonymous admirer of his and starts hounding him, expressing her 'feelings' in no uncertain terms. Lovely Singh however proves to be a tough nut to crack, and it takes quite a bit of doing from her side to penetrate his fort-like exterior. But once she succeeds in doing so, he transforms into a completely different person. Divya is triumphant and is all set to relish her regained freedom. But things take an unexpected turn when she learns a few things about Lovely Singh. Things that she could've never even imagined! And she soon finds herself trapped in a dilemma that she's unable to resolve! And with her, soon enough, Lovely Singh finds himself ensnared in a web of lies, trickery and deceit! Bodyguard is the story of conflict- between innocence and mischief, love and power and life and death! The story is oven fresh and the screenplay (both credited to Siddique) is captivating especially in the second half. If compared, the first half is slow paced, repetitive and even gets boring after a point. Dialogues have the required punch and a few lines especially rendered by Salman are very cute in the way he says it. After having made twice (in Malayalam & Tamil) already, director Siddique has mastered the technique and exactly knows how to treat this subject and he does full justice in making it in Hindi for the third time. He has very well succeeded in blending the narrative and treating it as a typical Bollywood masala potboiler. 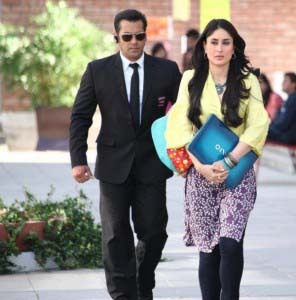 A role tailor made for Salman, it’s a treat to watch him as a ‘no-nonsense’ bodyguard and also an innocent lover. Kareena looks gorgeous (like always) and has ample scope to perform and she leaves a strong impression. The chemistry between the two is heart-felt mainly in the climax portion. Hazel is limited to playing a side role but the twist in her character in the pre-climax makes it noticeable. Rajat Rawail has a knack for comedy and he really makes you laugh in a few scenes. Raj Babbar is effective while Mahesh Manjrekar and Aditya Pancholi play their part sincerely. Chetan Hansraj and Mohan Kapoor merely fill the gap. Asrani is wasted. Katrina Kaif springs a surprise in a guest appearance in a song sequence. Music by Himesh Reshammiya is tuneful and the ‘I Love You’ song by Pritam is soul stirring. Lyrics by Shabbir Ahmed and Neelsh Misra are situational. Cinematography by Sejal Shah is of highest standard. Background music by Sandeep Shirodkar adds zest to the proceedings. Art by Shailesh Mahadik and Monica Angelica Bhowmick has grandeur. Choreography by Vaibhavi Merchant, Ganesh Acharya and Vishnudeva is functional. Editing by Sanjay Sankla is just perfect with the film’s length only a little over two hours. Costumes by Alvira Agnihotri, Ashley Rebello and Manish Malhotra are eye appealing. Above all, action by Vijayan Master is simply ‘unbelievable’ to say the least. Although most of it is created on computer (SFX/VFX), the way it is stylized can give tough competition to any Hollywood movie. All in all, ‘Bodyguard’ is an absolute entertainer. Or shall I say a ‘Lovely’ film. Nothing short of ‘blockbuster’ stuff! ‘Apne aap par ek ehsaan karo, jaao aur ‘Bodyguard’ dekho’.